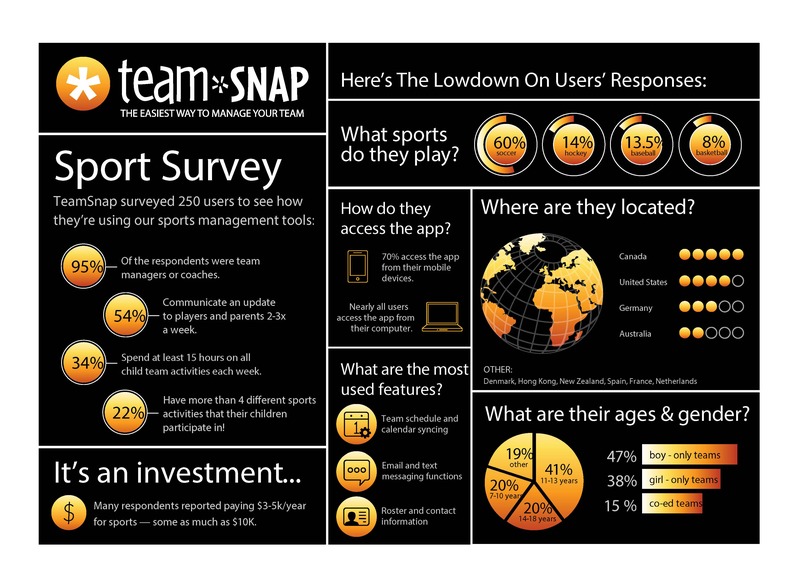 We surveyed about 300 TeamSnap coaches and managers and asked them how they are using sports management tools for their busy lives. Check out the results, and learn just how crazy TeamSnap coaches’ and managers’ lives really are! Click on the image below to enlarge the infograph. The highest percentage of respondents reported paying in the range of $3,000 to $5,000 annually for youth sports, and several reported paying as much as $10,000 per year. Nearly all users access the TeamSnap application from their computer while 70 percent access it from their mobile devices. The most common sport played by its users is soccer at 60 percent of respondents, followed by hockey at 14 percent, baseball at 13.5 percent and basketball at eight percent. The most common age bracket is 11 to 13 years old at 40 percent of respondents, followed by 14 to 18 years old and 7 to 10 years old, both at 20 percent. The most used features are the Team Schedule and Calendar Syncing features followed by the Email and Text Messaging Functions. The Roster Feature was next. A substantial 80 percent of the respondents were team managers or coaches; 54 percent communicate an update to players and parents two to three times a week, 34 percent spend at least 15 hours on all child team activities each week. Communicate Instantly and Get Real-Time Game Updates with TeamSnap Live!